...the performance at the center of Invictus is actually a quiet but visceral one by Damon as Pienaar. Pienaar is, after all, the character most affected by the changes in South Africa after Mandela helps bring an end to apartheid and ascends to the presidency. Within the story, Mandela is simply the agent of change that advances the story. 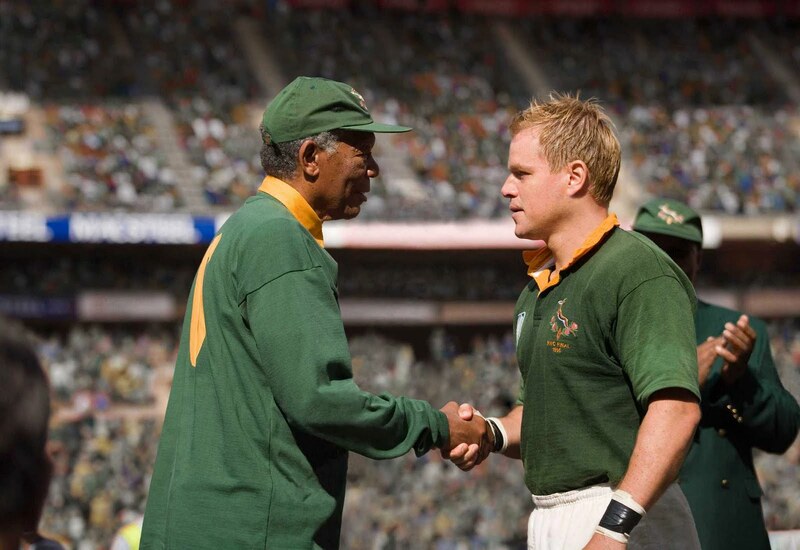 So those maligning Invictus for its simplistic depiction of [Mandela] are failing to comprehend why this film works. At its heart, this sports drama is inspired by Mandela rather than about him. Invictus also shows Eastwood handling the abrupt tonal shifts which often mar his stylistic mash-ups quite deftly this time. The suspense offered by political and racial turmoil are integrated somewhat neatly with the traditional rousing sports narrative, and in fact, raise the stakes far more dramatically than the usual attributions to personal honor and codes of manhood. It's a movie that slyly retains its immediacy despite its director's understated classical style of filmmaking, an astonishing feat in this age of big budget studio fluff. I saw this on the plane a couple of days, ago, admittedly watching a movie on the tiny screen on the back of the seat in front of you is not ideal, but it didn't really engage me. I liked the portrait of Mandela the best, they showed him as someone who could rise above any petty grudges and do what was best for the country and to be an impressive personality. I may have been prejudiced somewhat against the movie by Bill Simmons's review of it at ESPN, but apparently the Damon character in reality was one of the all time great rugby players and an imposing physical specimen, and Damon just doesn't have the physical presence to convey that. I wonder if someone like Jason Statham might have been better in that role. And the final game began to get a bit tedious (this may have been due to the airplane factor) and I ended up fast forwarding through it quite a bit. Overall I'd give it an "eh" rating. Man you lost me as soon as you said you saw it on a plane. Even the very best films don't play that well with all the distractions you run into there. Admittedly you're right about Pienaar's formidable physical presence in real life. But Damon manages to pull it off quite well. Give the movie another chance if you run into it on cable.